China successfully launched the nation’s flagship Long March 3B booster carrying a military communications satellite yesterday. The spacecraft, designated ChinaSat-1C, was launched at 11:46 a.m. EST (16:46 GMT) on Wednesday, Dec. 9, from the Xichang Satellite Launch Center, located in the Sichuan province in southwest China. The launch was declared successful by Chinese officials about two hours after liftoff. However, the mission is shrouded in secrecy. No prior notice was released before the launch and no technical details were made available about the satellite. This suggests, but does not necessarily prove, that the spacecraft was launched for military purposes. After lifting off, the Long March 3B rocket fired its four boosters along with its large core stage, completing a short vertical ascent and then started heading in the southeast direction. The shutdown of the boosters occurred about two minutes into the flight and they were jettisoned one minute later. The spacecraft was deployed approximately 26 minutes after the launch. The satellite was delivered into a geostationary transfer orbit (GTO) where it is hoped it will remain in operation for about 15 years. ChinaSat-1C is probably the second satellite of the second generation Fenghuo geostationary tactical military communication satellites. Fenghuo satellites are used to provide tactical communications for Chinese military forces in the form of secure data and voice links between ground terminals. The first satellite in the series, ChinaSat-20, was launched in 2003. The Fenghuo spacecraft are based on the DFH-4 satellite platform. The DFH-4 bus consists of a propulsion module, service modules, and solar arrays. Its dimensions are 7.7 by 6.9 by 11.8 feet (2.36 by 2.1 by 3.6 meters), with a mass of 5.2 metric tons. It has an output power of 10.5 kW and can be equipped with C, Ku, Ka, and L transponders. This platform is designed to host high-power and high-capacity communications payloads for different applications such as direct broadcasting, tracking and data relay, and mobile communications. The three-stage Long March 3B rocket used in Wednesday’s flight is currently the most powerful Chinese rocket in service. The 180-foot (55-meter) tall booster is capable of launching up to 12 metric tons of payload to low-Earth orbit (LEO) or 5 metric tons of cargo to GTO. The 3B/E version that was employed for the mission is an enhanced variant of the rocket, featuring an enlarged first stage and boosters. This version of the Long March rocket was brought into service in 2007 to increase the rocket’s GTO cargo capacity and lift heavier geosynchronous equatorial orbit (GEO) communications satellites. With the launch of ChinaSat-1C, China continues its impressive streak of successful launches this year. So far, the country has conducted 17 missions so far in 2015 – all of them apparently successful. Only Russia and the U.S. have carried out more, with 23 and 19 missions sent aloft respectively. Wednesday’s flight was also the 220th mission of the Long March carrier rocket series. China plans to carry out two more launches by the end of 2015. The next flight is scheduled to take place on Dec. 18 when a Long March 2D rocket is scheduled to send the DAMPE (DArk Matter Particle Explorer) spacecraft into space. It should be the country’s first-ever dark matter probe. The spacecraft is designed to detect electrons and photons with unprecedented energy resolution in order to identify possible dark matter signatures. 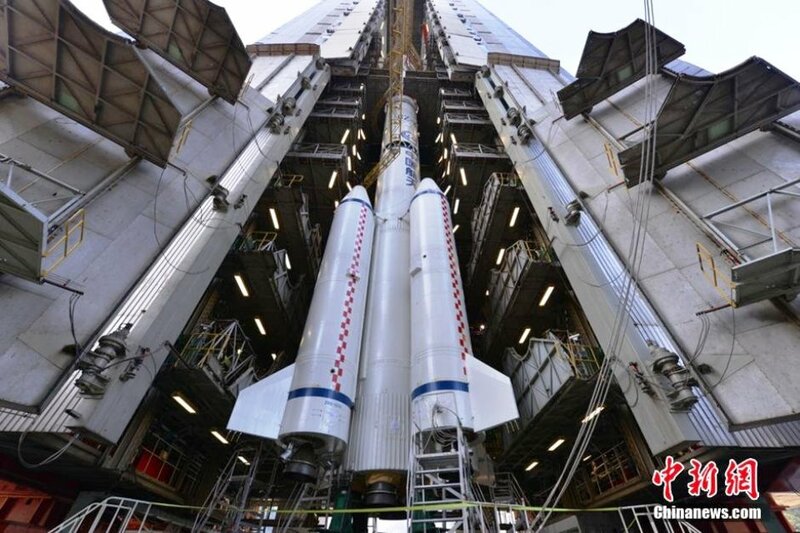 The exact date of the last Chinese launch of 2015 has yet to be announced. The rocket, tasked with delivering Gaofen-4 Earth-observing satellite into orbit, will be the Long March 3B booster. Given that many of China’s launches are shrouded in secrecy, the Gaofen-4 satellite could be launched earlier without any prior notice.